Well, the rainy weather has delayed what I wanted to share with you today. So I think I'll show this incredible spice rack instead. Before, my spices were spread out in three different places, and were very difficult to get through. I had to move them around, and pull some out to see which one they were, until I found the spice I needed. Not exactly the kind of thing that makes you look forward to making a nice homemade meal from scratch. Not only is this thing functional, but it is absolutely the most beautiful thing in my kitchen! (Well, maybe not THE MOST, but it sure competes for the title!) Just one more thing I have been blessed with to make my home more organized and efficient! That is AWESOME! I WANT one!!! :) Have a great Saturday, friend! I want one too! Heads up though - take a sniff at the spices to make sure they're still fresh. Some spices get stale faster than others, and you don't know how long they've been in the box. I need to get to Brandsmart! All the one's I've checked so far are still good. They have an airtight seal on the inside of the lid. I had to take them off to use the spices. Yes, you are fortunate enough to have a store in your state! 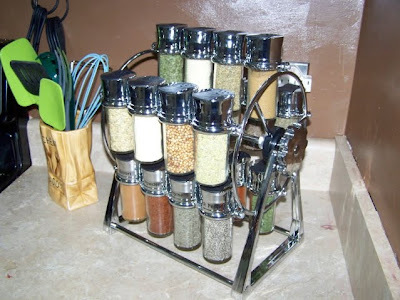 That is a very cool spice rack!!! Well, I found an Olde Thompson spice rack at Winners and I bought it! It's not quite as cool as yours, but I still like it. It's kinda like a double decker lazy susan. Oooh, I found it on their website - it's this one! I got it for $30, not $50 like the site lists it. YaY! How wonderful Tammy! It looks beautiful too. 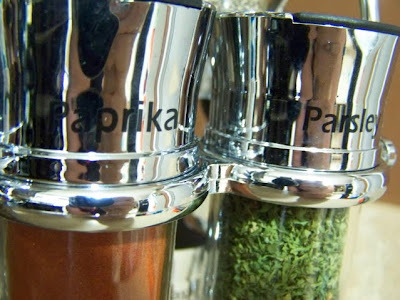 I love the look and functionality of the jars! I hope you'll love it as much as I love mine! It's always noticed by anyone who comes in my kitchen too, which is nice...I've waited a long time to have a few things of my own that people find interesting!